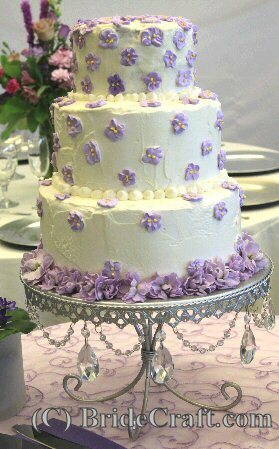 Create Royal Icing Flowers for Your Wedding Cake! Want to dress up your cake, cheap? 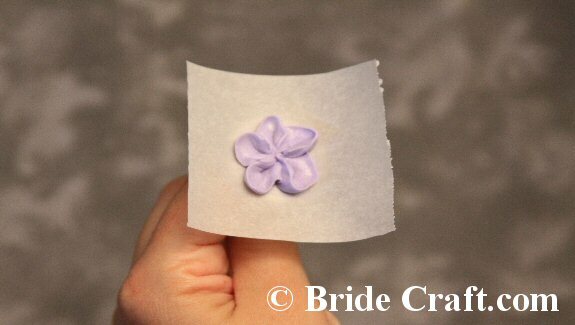 Royal icing flowers are a perfect option! Hardened sugar blossomed piped out by hand, they're simple and supar affordable. Consider DIYing them for your wedding cake. Pros: This project might cost you just a few dollars, saving you far more than that by cutting out the baker's labor. Easy to get the hang of, and fairly customizable by color. Great back up available in the form of the cake folks over at Wilton! Cons: A bit discouraging at first if you don't immediately pick up the technique. Acheiving the exact consistancy of the icing can also be a trick. And it can be time consuming to create a lot of blossoms. 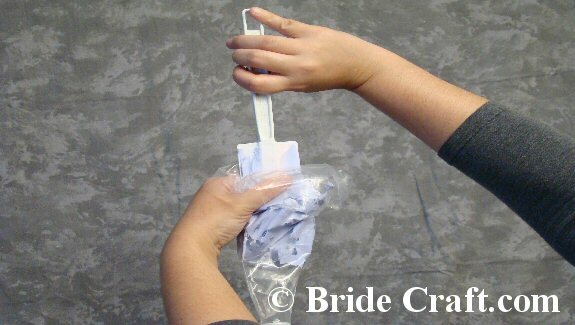 Step 1: You will need several disposable plastic decorating bags, 2 plastic couplers, 1 flower nail, several tooth picks or bamboo skewers, decorating tips #102 and #2, scissors, purple and yellow food coloring and parchment paper. 1 pound of confectionary sugar, 3 tablepoons of Wilton meringue powder and 6 tablespoons of lukewarm water mixed together with a mixer until the icing looses it's sheen and becomes matte. This should take between 5 and 10 minutes at medium speed. Seperate a small amount of icing into another container, and use the skewers to dip into the yellow food coloring and mix the tint in. Do not reuse the same skewer, but start with another if you would like a deeper color. Repeat with the purple food coloring on the larger portion of icing. 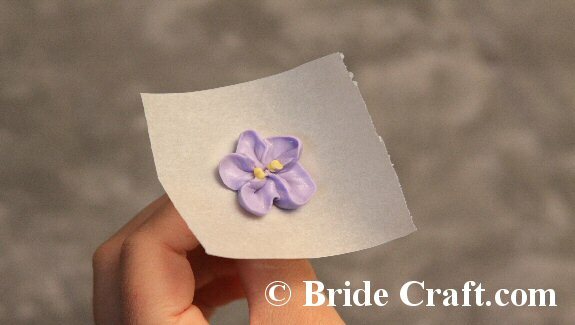 Other: This royal icing flowers project is directly inspired by the Wilton cake course. While I certainly don't do it exactly the same way, they are the masters and are a great resource to practice and build your confidence with. Step 2: Take your disposable decorating bag and cut an opening for the coupler. 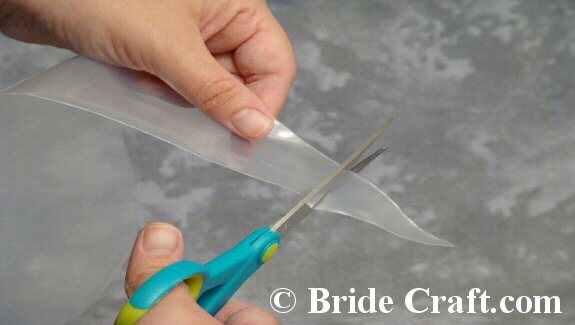 Tip: It’s very easy to cut too big of an opening and waste a bag! You can gauge how much you need to cut by first pressing the coupler snuggly into the tip of the bag and creating an indent. Step 3: Insert the base of your plastic coupler and insert a #102 tip over it. Step 4: Secure the tip with the top portion of the coupler. Screw firmly into place. 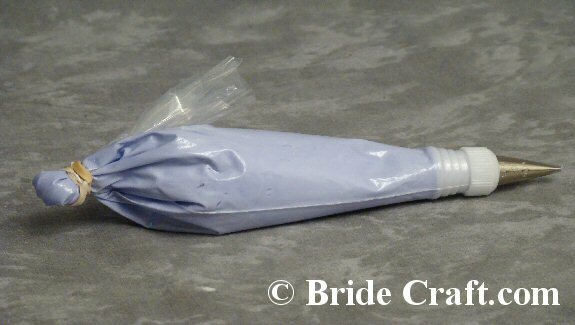 Step 5: Begin filling your prepared decorating bag with icing. 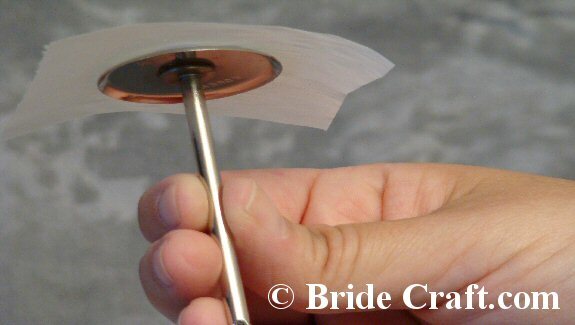 Tip: The easiest way to do this is to grasp the bag in your palm and fold it over your hand. Then take a spatula full of icing and scoop it into the bag, using your hand to squeeze it down towards the tip of the bag. Step 6: Secure the end of your bag by twisting it and tying it off with a sturdy rubber band. Tip: Do not over fill your bag, as this will make using it less manageable. Step 7: Prepare several dozen parchment squares. 2”x2” squares will work fine. 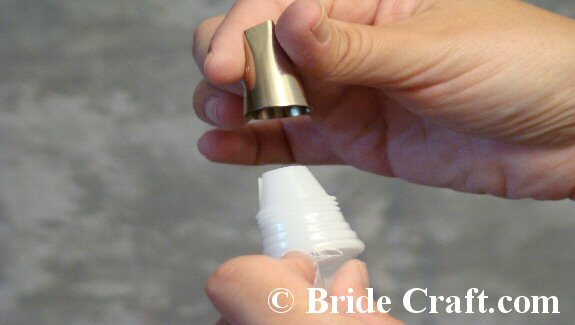 Step 8: Take your flower nail and dab a bit of icing onto the center to act as an adhesive. 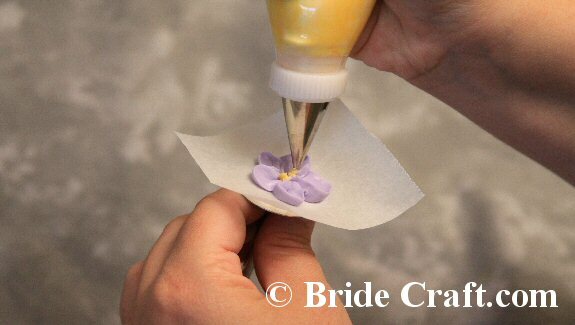 Step 9: Secure your parchment paper to the flower nail and icing. 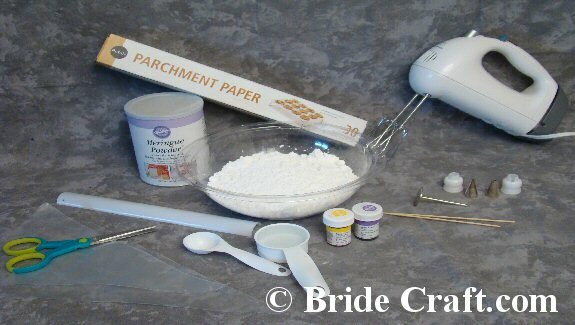 Tip: Be sure to press firmly, so that the icing holding the parchment take good hold and flattens put. You will want your nail surface to remain fairly flat. 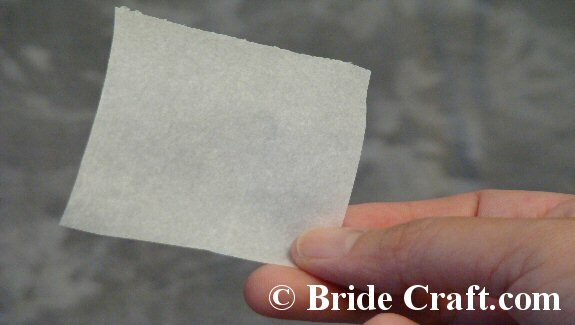 Step 10: Position your nail at a slight angle towards you, with your tip almost touching the parchment paper. Make sure that the “fat” end of the tip is pointing down, closest to the paper. Begin squeezing with a light pressure. Start from where you want the center of the petal to be, and move out from there, rolling the nail slightly between your fingers to help move the tip into position to end the petal. Repeat a second time. Note: Do NOT expect to get the hang of this right away! It takes time and practice to get this right. Don’t be discouraged, but keep trying! Step 11: Complete the flower with three more slightly smaller petals. Step 12: Prepare a second decorating bag using tip #2 and your yellow icing. 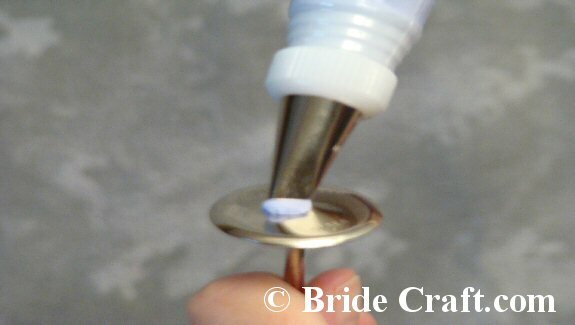 Carefully pipe two small dots within your royal icing flowers, as shown. 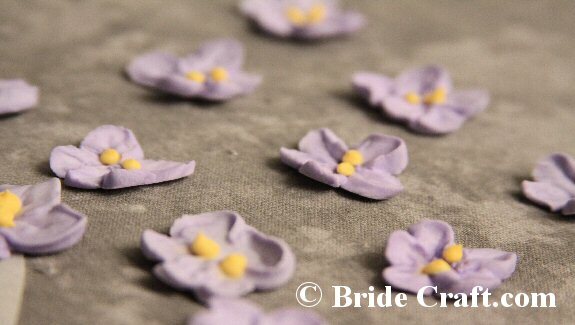 Step 13: Your African violet inspired royal icing flowers should look something like this. Step 14: Congratulations! 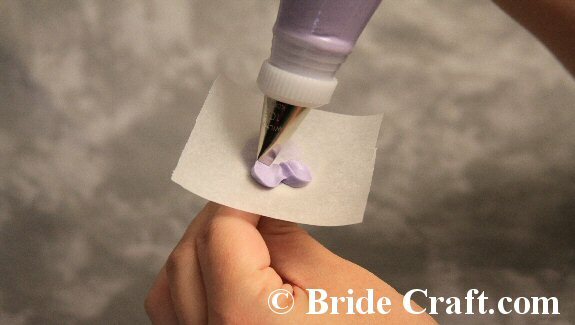 You now can start making tons of little royal icing flowers to dress up your wedding cake. Store in clean, dry and air tight plastic ware until showtime!